We just watched Beauty and the Beast yesterday. Late I know, but we got the movie house to ourselves so it ain’t that bad. 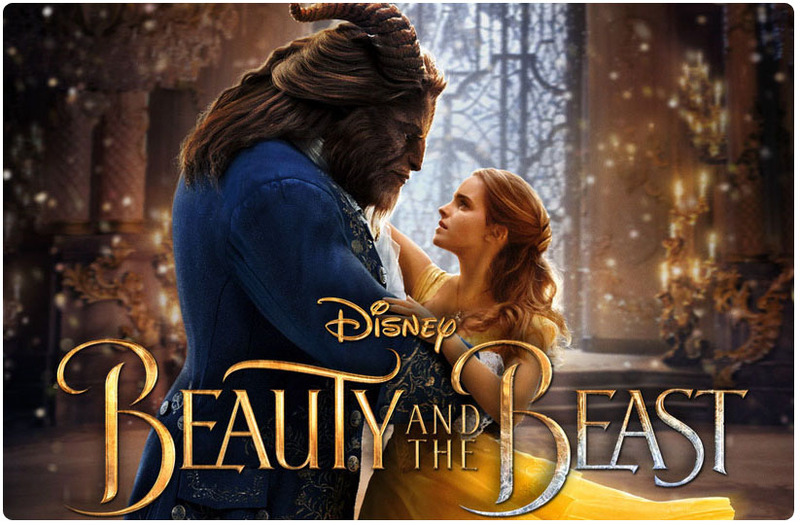 Emma Watson looked so pretty as Belle, as well as the remake of Belle’s yellow gown! Luke Evans also did a great job playing Gaston. To quote my bestfriend Jo:”If movies are cheap, I would watch it over and over again”. -I would definitely do that too! I still have last song syndrome from the movie. No, actually make that from all the familiar Disney songs of my childhood. I sing along to them! Back to the movie, I liked how they made it as close to the cartoon that I watched countless of times in the TV and in my ViewMaster. Lighted View Master just like mine. The only reels I have was Beauty and the Beast and Flintstones. I swap ViewMaster reels with my friends.- That way we all get to watch different stories without having to buy a lot of reels. So retro. And In the topic of being late and retro… Riverdale is delayed!!! But again its ok. Because the series is renewed by CW for season 2! So relieved! 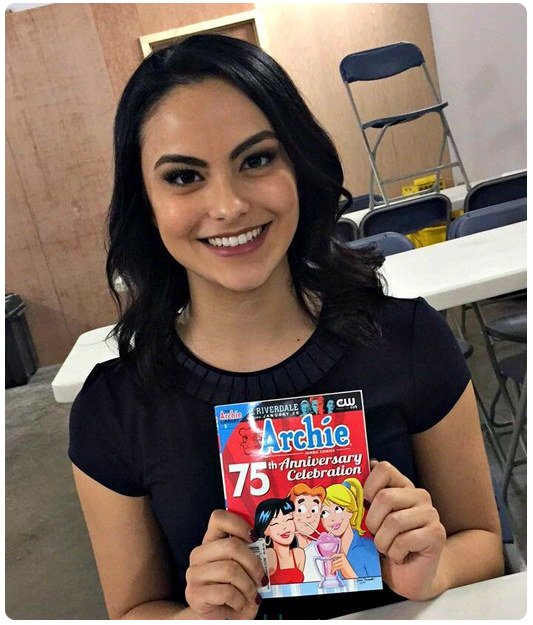 Archie Comics in a show. My favorite new show this season. I am still waiting for the next episode of Riverdale! Excited much?! Categories: childhood, life, movies, Uncategorized | Tags: 2017, archie, beauty and the beast, camilla, camilla mendez, comics, lighted view master, movie, riverdale, view master | Permalink. Pokemon Go has just been launched in the Philippines and of course Kei was already playing the moment they released it! It even made him walk from our home to my office. Oh the wonders of portable wifi. I started playing last saturday night- Aug 6,2016. With the intention to just try it out. After a whole day at work, I also got the app once I got home. I am very much curious and I watched Pokemon as a kid so I can relate, I wanted to go try it out for myself. And promptly got my first Charmander. Followed by a Rattata then a Pidgey, Magicarp followed and lastly by a very confused Psyduck. 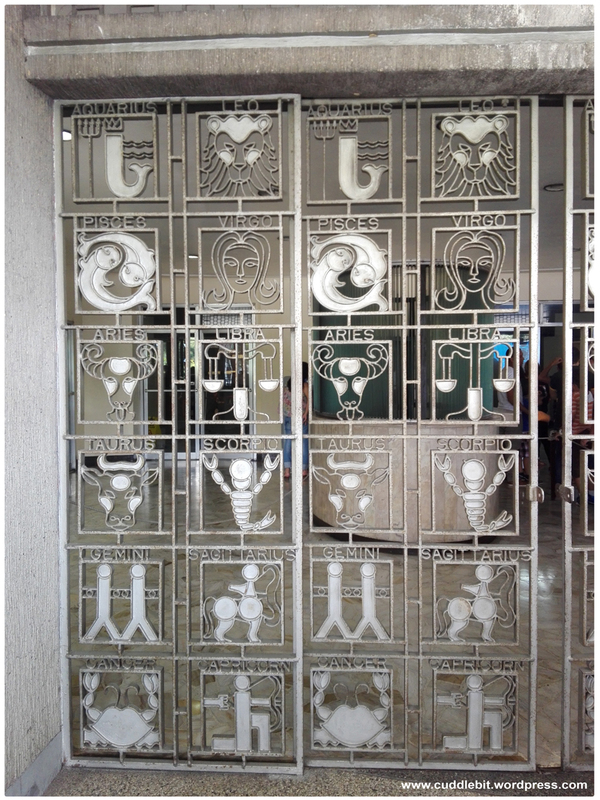 Those are the Pokemons that reside in our home. Pretty common ones, but we do really have a lot or real pigeons at home so maybe it is only right that their Pokemon counterparts are also found at our home. After much grumbling and no wild pokemons, I saw someone nearby set out a lure on a Pokestop to trap Pokemons. I decided that I would head out. Kei was adamant since I wanted to go out at 12 midnight. He relented and accompanied me to the market (two corners away from home) that was as far as he allowed us to go. –I never made it to the Pokestop. Its technically three corners away from home. I did get pokemons but just not what I wanted. I wanted a Evee. So that midnight trip out, I used one of the incense and got a Poliwag, Pinsir and numerous Pidgeys for heading out at night. I just turned the low levels into candies. second batch! -I used incense for the pinsir and poliwag. I also caught numerous Pidgeys *bonus that psyduck was the last Pokemon I caught before venturing out. The next day, was a normal day for us. I went to scrub the patio and Kei did some home decor project. After lunch he asked me where I wanted to go. I told him that we could continue playing pokemon at the mall. Then came the next question, what mall do we go to? 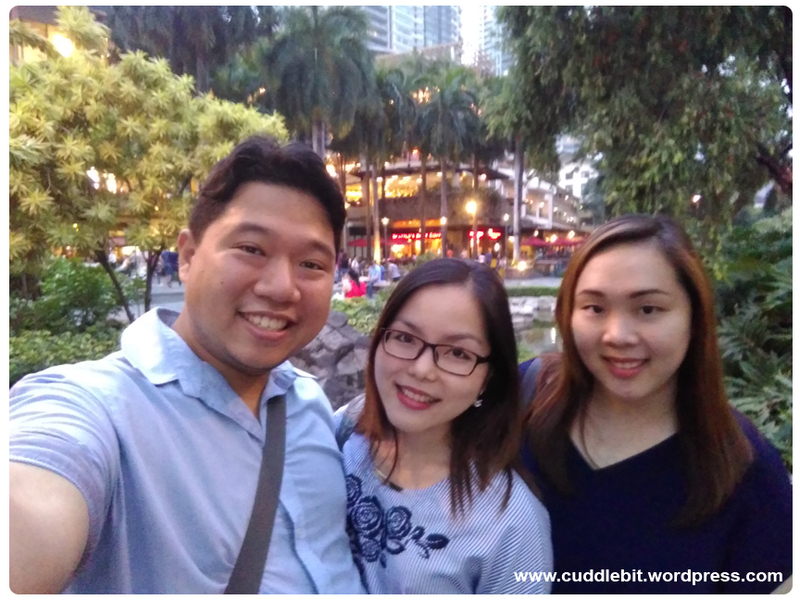 After a bit of thought, I asked to go to Robinsons magnolia because they have a park = possible pokemon spawning ground, they have Daiso, Gourdo’s, True Value, Starbucks, a food court, supermarket and National bookstore all of which are our usual haunts. So a quick 30 mins later we are headed to the mall! 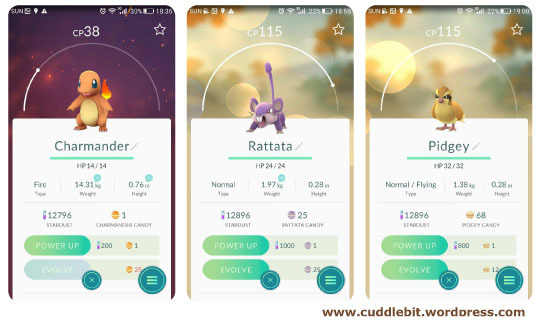 On the way I managed to get a lot of Rattatas again, some Magikarp…. Then Goldeen, Horsea, Tentacool, a lot of Weedles and two Venonat. Again, those that are low levels are made into candies. At the mall we saw that there are lures on every Pokestop! (they have 3) That got me very excited to try my luck in catching more! 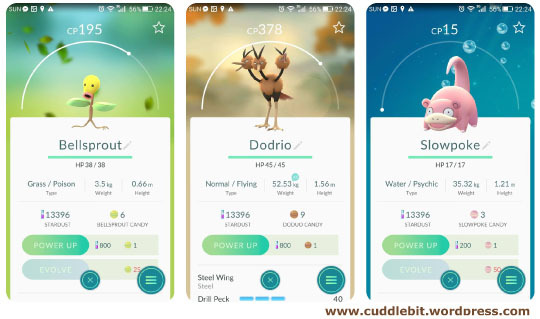 So first few casts yielded Staryu, Weepinbell, Pidgeys and Pidgeottos. 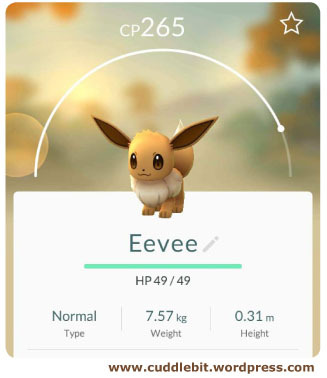 I was getting a bit sad I tried walking away and moving to another area, when I spotted my first Evee! I hurriedly caught it and never moved away in hopes of getting more and true enough! I got three more Evees! Then it was back to the Pidgeys again. 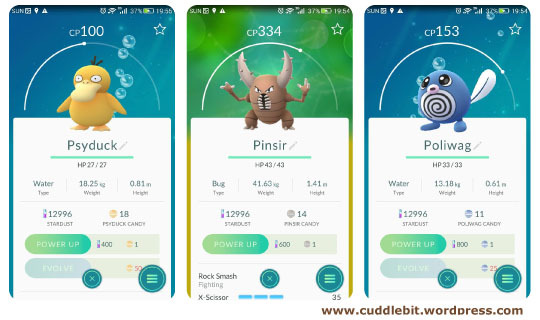 As I was about to give up and just go malling, I got a Bellsprout, Dudrio and Pinsir. Not bad. Going back home we decided to get a massage and while walking I encountered a Slowpoke. But that was just the only one I got. The rest are Pidgeys and Rattatas again. Hopefully my next hunt will yield something better. For now, I am very much content with my Evees. Soon I am going to explore Ortigas area to get myself a Pikachu I was told they are found in Megamall. So, from trying it out to wanting to collect them all, I must say this game is highly addictive! I wanted to catch more Pokemons and making some Pokefriends along the way would make this even better! *need more detailed tutorial? Maybe getting Pikachu as your starter pokemon? 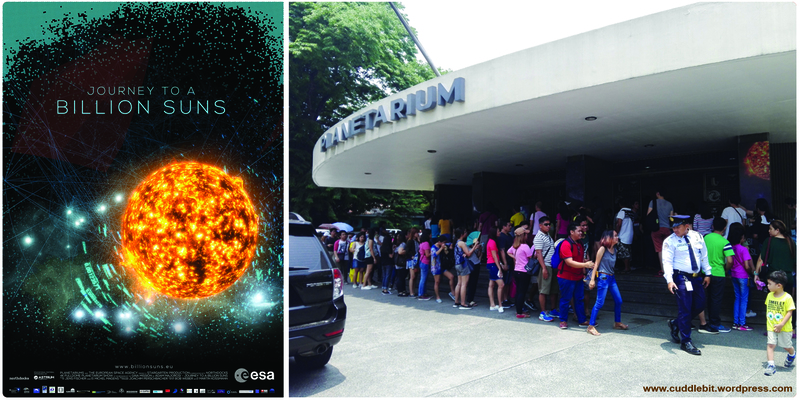 check out Kei’s blog about Pokemon Go Philippines! Happy Hunting! 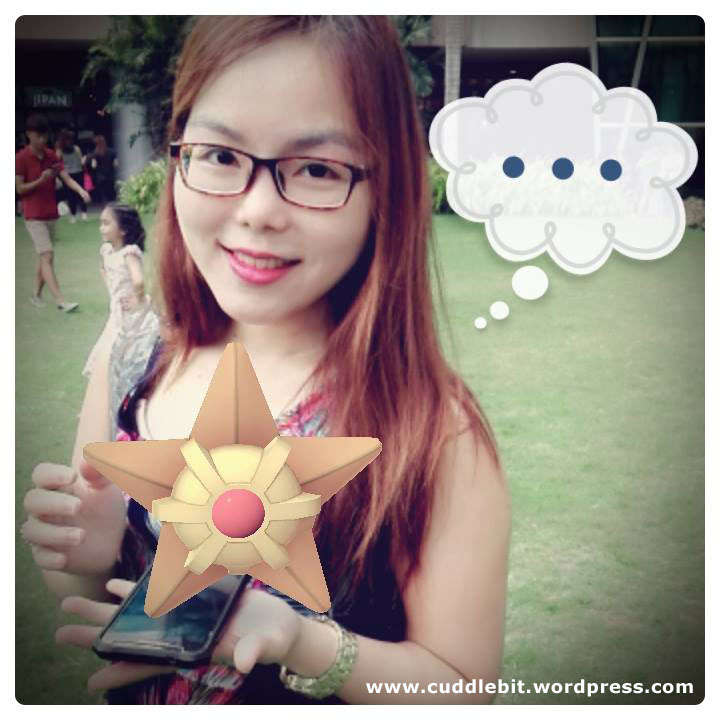 Categories: childhood, nostalgia, reviews | Tags: bellsprout, bgc, candy, charmander, dodrio, evee, go, goldeen, horsea, list of pokemon, lure, magicarp, mall, manila, ortigas, Philippines, pidgey, pinsir, places, pokelure, pokelures, pokemon, pokestop, poliwag, psyduck, rattata, review, slowpoke, tentacool, venonat, weedle, where to find pokemon | Permalink. Because nothing screams bridal quite like a white ball gown wedding dress. 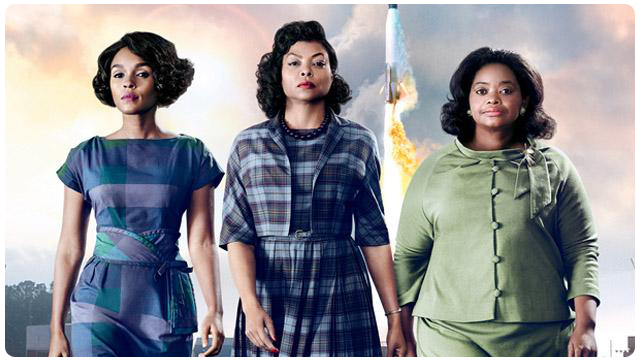 The photo shows a dress named Pam. Just like my name. It was named after me. 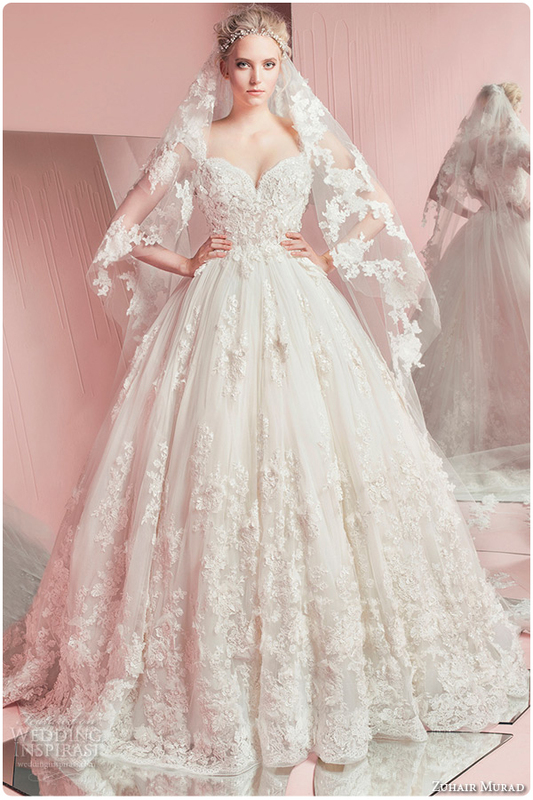 After all this is a Zuhair Murad 2016 spring-summer bridal collection, a strapless number with sweetheart neckline and lace embroidery, romantic style white wedding ball-gown dress with veil. That was quite a description. So, when did I want to look like a generic bride? Since I had my wedding gown barbie. That was eons ago. Or was it because all my friends wore white ballgowns? And all the aunts thinks a ball gown looks more expensive than other styles? I examined pictures of the dresses I fit again, and again. Maybe more hours staring at it than I care to admit. It has been a warped huge cloud of a dress with a lot of stuff. I am trying to stuff every dress I wanted in my entire 29 years of living into one. That is a very very tall order. And a scary one at that. I wanted the big huge giant ballgown like what my barbie doll wore from my childhood days, the pink prom dress I wore, my lilac enchanted dress given to me by my uncle, the polka dotted peach tea dress from my aunt, a berriboned fuschia and pink floor length gown that made me feel better after having an asthma attack, the silver and periwinkle ballgown I wore to my cousin’s wedding… basically, I wanted to top off everything I had worn. I wanted my wedding dress to be the best dress that I am going to wear on my entire life. I wanted all the magical stuff in the dress: the corset boning, the glitter, embroidery and lace, layers upon layers of sheer tulle, the frosted organza, sparkly buttons, ribbons, beading etc. All the good stuff in petite size, within my budget. Talk about being difficult. And nowhere realistic or practical. I am having a hard time picking out what I like. Can a mermaid be a ballgown at the same time?! I refuse to settle and spent unreasonable hours poring over magazines and the internet. I keep on saving a ton of pictures that does nothing but to muddle up my thoughts more. But the wedding is still six months away, I thought. What about all the other dresses out there, the ones that might be better? How can I be sure that the dress I picked, express who I am when it has features that are not really me? or not the usual? not the traditional? not like something I would wear? is it too boring? too classic? does this look bridal and formal enough? is it unique enough? So I look for another dress… and the cycle of doubting my decision/s begins again. To hell with what everybody thinks. I am going to pick what makes me happy. After all there may be other brides who will wear the same style of dress that I wore. That only means I have impeccable taste. Would be my wedding be less of a wedding if my dress looks similar to another bride’s dress? No. Will my Marriage be better if I wear a Vera Wang or a Zuhair Murad? No. Will my entire wedding be recreated by other brides who used the same wedding suppliers I got? I don’t think so. The fact that there is only one me and one Kei makes our wedding unique. Will my wedding dress be the most awesome thing I will wear? probably. But it is sure that I will wear more dresses after, maybe not as pretty as my wedding gown or maybe even better than my gown. Who knows? My 25th wedding anniversary/renewal of vows dress might top the first dress. When I removed my unrealistic expectations about what I wanted from the dress, did I like what I saw. I envision myself as me only better, a polished and smiling me ready to walk to the arms of my beloved. Categories: beauty, childhood, dresses, Uncategorized, wedding | Tags: 2015 bride, anxiety, dress, impeccable taste, NOT YOUR USUAL bride to be, other brides, Pam, Pam dress, Philippines, pink prom dress, practical, realistic, realization, same style of dress that I wore, spring-summer, thoughts on the dress, unrealistic expectations, wedding, wedding dress, wedding gown, wedding gown barbie, zuhair murad, zuhair Murad 2016 | Permalink. Mention perfume to me and one of the images that will spring to my mind is my (late) Grandma from the father’s side. She is one classy lady with a taste for the finer things in life. She has a huge perfume collection (and adores scents from Dior), collected jewelry (gemstones), tended a garden full of (scented) tropical flowers and only wore tailored clothes. She has perfectly maintained curly white-grey hair, always seen wearing a muted pink lipstick and smells heavenly even if she only stays at home. Fancy. I know. More so, now that I can comprehend a bit of how fabulous she and her life was. I can recall my childhood days with her walking around the living room carefully arranging freshly cut flowers on the vase. She normally uses Sampaguita (Jasmine) as altar flowers. 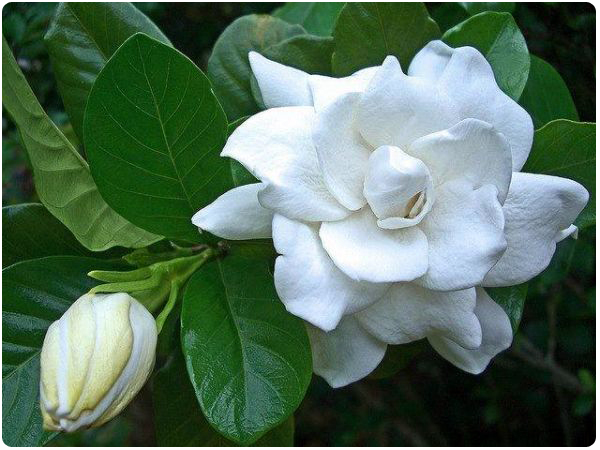 But for home decorating, her flower of choice was locally known as Rosal (or a Gardenia). I loved that it looks and smells lovely. The scent alone reminds me of her. But my Grandma is already in another place now, her tailored clothes are nowhere to be found, the gemstones are already lost, the garden which she lovingly tended has grown tangled and unruly, her regal home is now a a empty shell of beauty it once was. Soon enough, the house was sold, along with the fragrant garden. The said house holds a lot of my childhood memories as I grew up there with my cousins before we move to Manila to go schooling, I sometimes still think about it, I also miss my grandma, from the soft touch of her wrinkled skin and her faint lingering smell of perfume. I was only fifteen when she went away. Was given a small jade pendant (she once wore, is all I have) to remember her by. If only I have the brains then to save cuttings of her beloved plants, to be replanted to pots. Even only her signature flower the Rosal. So, I searched for a Rosal. I asked around, and came up empty. After months of asking. I was about to give up. I was resigned to the fact that the memory and the scent is lost and I should just go sniffing bottles of her (used to be) perfume/s to remember her. Then Kei took me to the relocated Manila seedling bank, It is now on Quezon City circle. There it was. A rather huge sized shrub with shiny dark green leaves. A Rosal plant about to bud. Without much thought we brought the plant along with a huge pot and soil. All the thought of gross-ness went out the window as we took turns carrying the huge and heavy potted plant back home. Kei took good care of it and as of now it has many buds ready to bloom anytime soon. We named it “Groot” from the Guardians of the Galaxy. We got a flowering plant to remember her by, I think my Grandma would smile at the idea. I am excited to see it bloom and also get Kei to smell what the rosal smells like. It smells like the scent of remembrance to me. Categories: childhood, fragrance, home, life, nostalgia, relationship, Uncategorized | Tags: bloom, bottles of perfume, bud, classy, collection, dior, father's side, fresh cut flowers, garden, gardenia, gemstones, glam, grandma, grateful, groot, Guardians of the Galaxy, home decor, jasmine, jewelry, manila, perfume, perfume collection, pot, potted plant, Quezon City circle, relocated, remembrance, rosal, sampaguita, scent, scent of remembrance, shrub, taste for the finer things in life, tropical garden | Permalink. First was my beloved tamagochi-digital pet. Mine was yellow, my pet is a dinosaur. I wanted to resurrect it, tried to place fresh batteries, but the thing was dead/broken. Still I decided to keep it, maybe get dad to fix it. Next was some Pogs and a plain slammer, in a tin can of Ouch bubblegum. Back in the days pogs and bubblegum/candies were our currency. Shiny slammers were worth more, and we have our lucky slammer. We trade them to other kids for cards, more pogs or more bubblegum/candies. Our bubblegum favorites was of course; ouch, bubble tape, bazooka, bubble jug and judge bubblegum. For candies, skittles, warheads, air heads, gobstoppers, nerds and runts were cheaper back then. 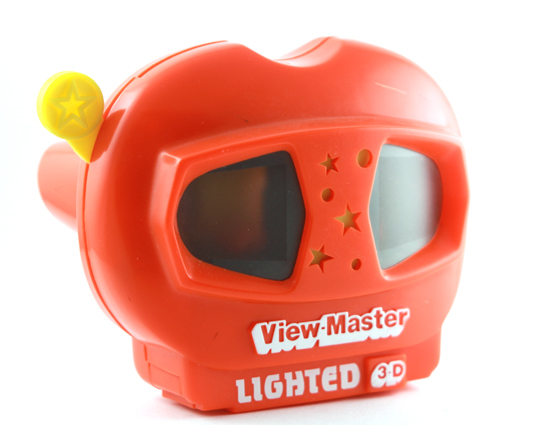 One of my treasured toys was a lighted Viewmaster. I have Flintstones and Beauty and the Beast reels. (that I watch and re-watch) My aunt got it for me from Duty Free, along with a lighted Poly Pocket because those were the rage back then. Those were my portable toys and they went wherever I go. Speaking of going places, though I have my bright red bike, I can be usually spotted wearing my purple rollerblades. I never took them off. Even when playing with jumping ropes. I am a rollerblade expert that way! I still have them but the straps are broken. Lastly, some red fragrance beads (we call them kisses, that lost their scent) that we place in our fancy automatic pencil cases (I lost mine). I think the scent was strawberry, but I am not sure. *I may go and try buying some of them again. Just to smell what they smell like again. We have this crazy idea that those fragrance beads get pregnant, and that those kisses give birth to more kisses (fragrance beads)! Mechanical/magic pencils are also a big deal back then, and it was every child’s dream to have all those fancy pencils. I had a laugh recalling those times. Those were the days. I am a 90’s kid. Categories: childhood, life, nostalgia | Tags: 90's kid, air heads, automatic pencilcase, bazooka, beauty and the beast, bike, bubble jug and judge bubblegum, bubble tape, bubblegum, candies, childhood treasures, currency, dinosaur, duty free, Flintstones, fragrance beads, gobstoppers, judge, jump rope, kisses, kisses in pencilcase, magic pencils, manila, Mechanical, nerds, ouch, pencil case, Philippines, rollerblade, rollerblade expert, runts, skate, skittles, slammer, tamagochi, viewmaster, warheads | Permalink.